What RC servos do you need for your radio controlled boats? Learn more about different servos: mini, micro, standard, jumbo, metal gear, ball bearing, digital, sail winch. RC Servos common in RC model boats: from left: 1/4-scale servo, a "standard" servo, and a "mini". 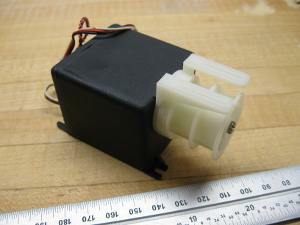 RC servos come in many varieties for a number of applications. Here are the most common with brief descriptions of what they can be good for as they relate to model boats. A lot of different servos that used to be exotic are now pretty much common place and the cost has dropped considerably over the years. Many of these featured are also combined. For instance, I believe all jumbo servos these days come with metal gears and ball bearings. As with everything else, performance costs money. Most expensive is the fastest and strongest with the lightest weight in the smallest possible package. Then there are "soft" features, such as brand. Futaba is probably seen as the best in RC gear worldwide. Others include JR, GWS, Hitec, E-Flite, Sanwa, ElectriFly, Traxxas, Spectrum and Graupner among many others. Unless your model boat relies on vectorized steering, your boat will need at least one servo to operate a rudder. This is the most obvious application of an RC servo on a model boat. For multiple rudders the traditional solution was to have a single rudder operate one rudder directly, and add parallel linkage between multiple rudders. While this method still works as well as always, it’s not the simplest to execute. With the reduced cost and weight of servos today, the same functionality can be accomplished with two servos and a Y-harness. Aside from being easier to install, this solution reduces back-lash between the servo and rudders. A standard servo can handle the steering of 90% of all model boats. Standard refers mostly to the size, not necessarily to the performance, so be sure to compare specs. These servos are great in small model boats; say less than 1kg (2 lbs). They also work well for applications where the servo needs to be located high up in the upper works for stability. Most RC kit conversions to RC can benefit from using mini or micro servos because these model boats tend to be top heavy. 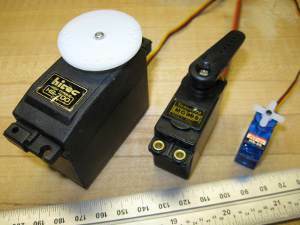 The term 1/4-scale servo stems from the use in model aircraft. A 1/4-scale aircraft is huge and therefore need a lot of muscle to move it's control surfaces. The applications in model boats is similar - big boat equals big servos. These servos also make excellent sail winch servos for medium sized rc sailboats. Digital servos are claimed to be more accurate than conventional analog servos. If you feel you need better accuracy, make sure you have a lash-free setup between servo and load first by using ball joints on all connections. If you still feel it's inadequate, consider digital servos. For sailboats, you’ll also need a winch servo to handle the sheet (or sheets) to control the sails. There are servos on the market especially designed for this purpose. These servos are optimized for pull force and either come with a drum or a long arm on the output shaft. Goliath amongst RC servos - a vintage sail winch servo capable of 10kg (22lbs) pull force. For many RC sailboats, where racing is secondary or non-existing, a regular jumbo servo can be used just as well with a home-made extended arm. There is little benefit in cost, but if you already have the jumbo you may as well use it. Scale model boats can be fitted with servos to operate other motions on the model boats, such as turret rotations on warships, cranes on working boats etc. RC Naval Combat skippers generally need several servos to trigger cannons and operate gun turrets. Back in the days you'd typically have RC servos operating switches for other scale model boat functions, such as lights and to turn motors on and off. This application is largely outdated because today a relatively inexpensive MERS (Micro Electronic Receiver Switches) that will do the same job without any mechanical motion. This saves power and space in the model. Years ago just about all RC Controls that were on the market came with at least two servos. Today the norm is shifting towards no servos included with the Radio. It’s probably fair, since your application may warrant a more specialized version than the standard servos typically provided.